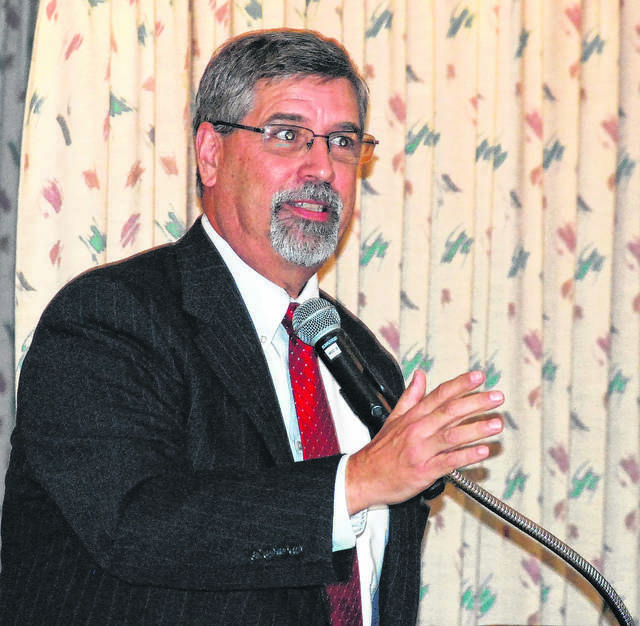 J Swygart | The Lima News Allen County Prosecuting Attorney Juergen Waldick spoke to Allen County Republicans at the monthly GOP luncheon on Friday. As your Allen County Prosecutor, I am writing this letter because your vote on State Issue 1 is one of the most important votes you will cast this election cycle. If State Issue 1 is passed it will be nothing short of catastrophic for Allen County and for communities across our state. You may have heard or read misleading claims that State Issue 1 is about improving public safety but the very men and women involved in every aspect of keeping our communities safe— judges, prosecutors, law enforcement officials, and treatment providers — have come together to raise the alarm about Issue 1 and urge “VOTE NO” on State Issue 1. Last year, on average, we had close to one overdose death per week in our community and several hundred addicts were brought back from death’s door with Narcan thereby avoiding overdose deaths in even greater numbers. Yet criminals that possess or transport these dangerous drugs, including heroin and fentanyl, would face nothing more than a misdemeanor offense and no jail time under State Issue 1. A person possessing enough fentanyl to kill a whole town would receive the same slap on the wrist as someone guilty of disorderly conduct. Ohio would become the preferred pipeline for drug traffickers, flooding our streets with more drugs and creating more addicts. For people already in prison, Issue 1 permits the early release of as many as 10,000 violent criminals, including human traffickers, armed robbers, thieves, drug traffickers, child abusers and child pornographers. It releases almost one quarter of the Ohio’s prison population immediately even though their crimes had nothing whatsoever to do with drug addiction. This robs victims of justice and puts dangerous criminals back on our streets. One of the most promising avenues of treatment at the local level are drug courts. These courts offer treatment as an alternative to prison. They are effective only when the “carrot” of treatment is combined with the “stick” of jail. 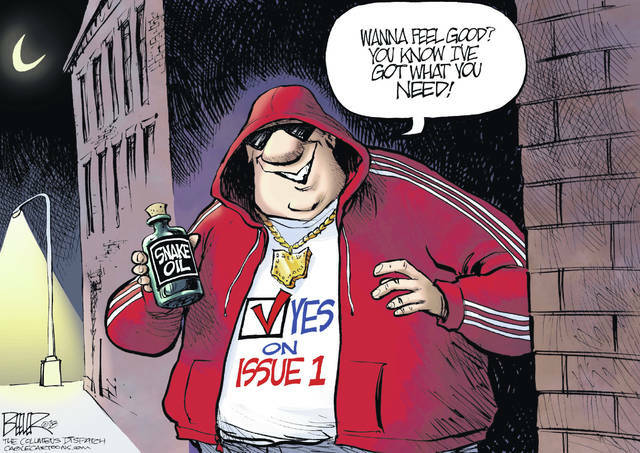 Despite the promises proponents make for how Issue 1 will benefit drug courts, former drug addicts, prosecutors, and judges — people in the trenches —agree that Issue 1 will thwart the effectiveness of drug courts. An addict’s brain is just not wired to voluntarily seek out treatment without drug court intervention and the threat of incarceration. By binding judges’ hands and taking incarceration — the “stick”— off the table, Issue 1 dooms these highly successful courts. Despite whatever promises and rosy predictions Issue 1’s proponents and their California billionaire backers make I can say with certainty that prosecutors like me, local judges, and our law enforcement will be left utterly helpless to do what you elected us to do to - keep our community safe. The extraordinary breadth of folks opposing Issue 1 should show how flawed this proposed constitutional amendment is. This November, I urge you to join prosecutors, judges, law enforcement and treatment providers in saying NO to Issue 1.
https://www.limaohio.com/wp-content/uploads/sites/54/2018/11/web1_Juergen-..-all-worked-up.jpgJ Swygart | The Lima News Allen County Prosecuting Attorney Juergen Waldick spoke to Allen County Republicans at the monthly GOP luncheon on Friday.